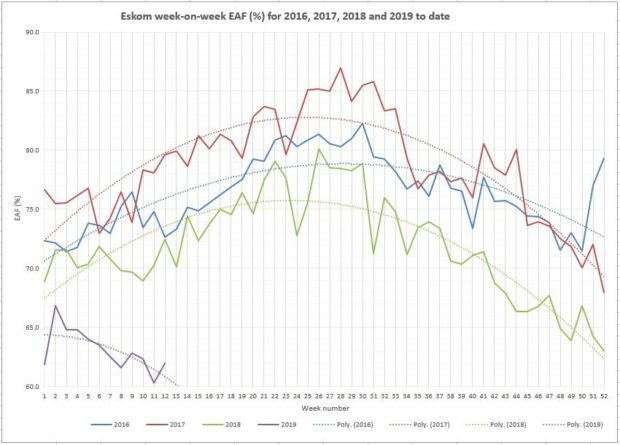 Electricity customers and the public in South Africa experienced Stage 2 (2000 MW) manual rotating load shedding in late 2018 and Stage 4 (4000 MW) in February and March 2019. However, while Nero fiddles the prospect of further load shedding is set to continue in the months ahead. 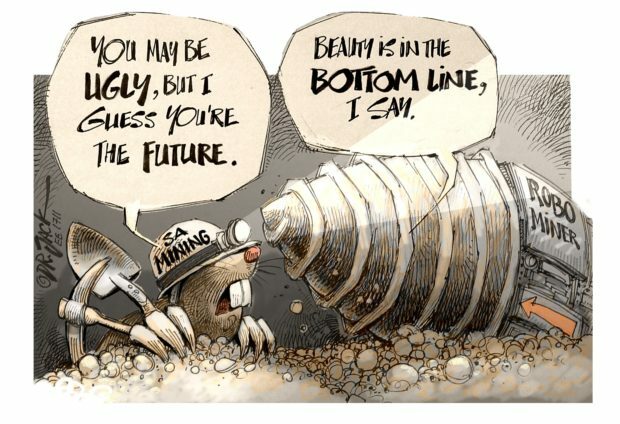 But there seems little sign that the bureaucrats at the South African Department of Energy (DoE), the National Energy Regulator of South Africa (Nersa), and the country’s national electricity utility, Eskom, have quite grasped the depth of the problem, or what is required to bring new generation capacity on stream quickly. 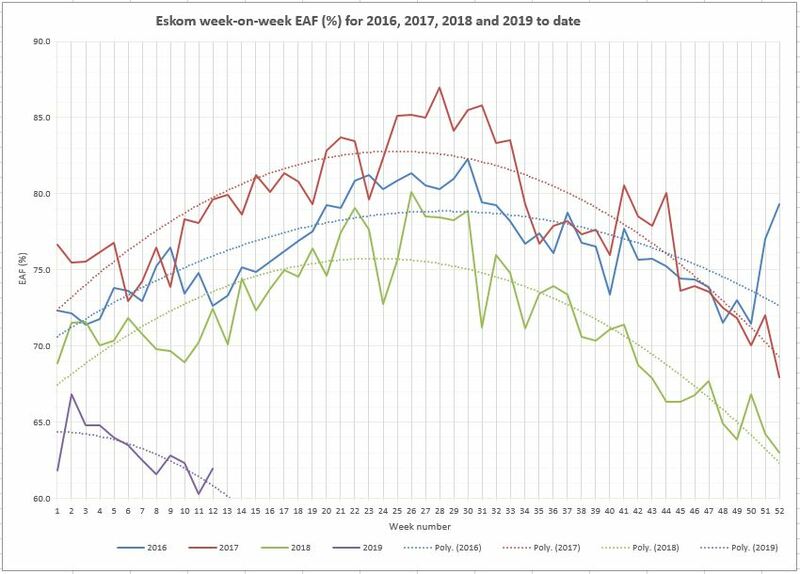 Eskom Generation week-on-week energy availability factor (EAF) for 2016, 2017, 2018 and 2019 to week 12. 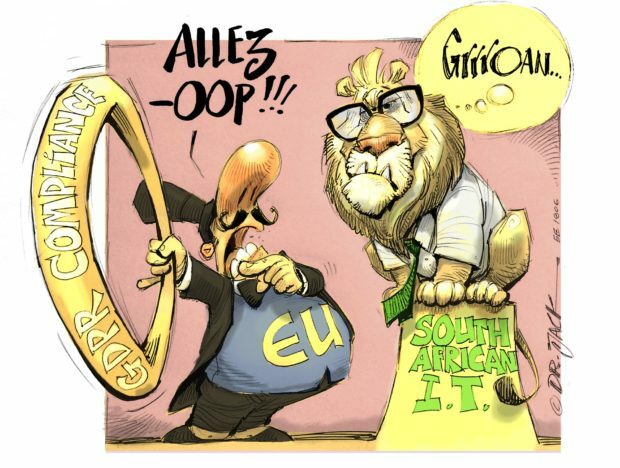 Having failed in the old Soviet Union, Cuba and Venezuela, South Africa still seems committed to a central command and control approach, particularly when it comes to electricity policy, planning, regulation and implementation. Unfortunately, this is proving to be way too slow and cumbersome for the needs of the modern economy. 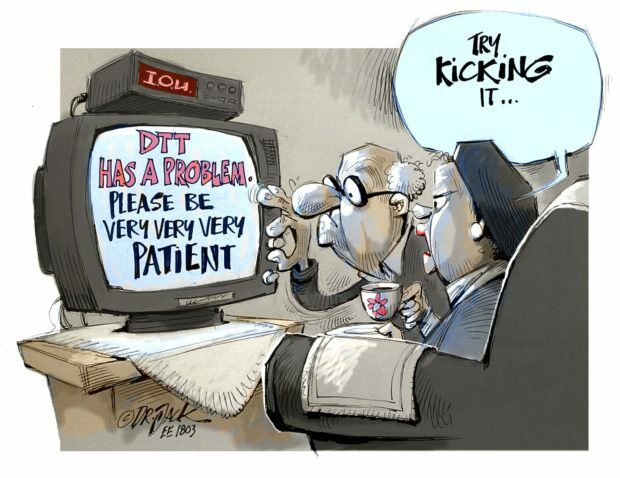 If there is one thing that the failed e-tolls project should have taught us is that, in the 4th Industrial Revolution, centrally imposed “solutions” that are not seen by customers to have their interests and needs at heart, will not work. 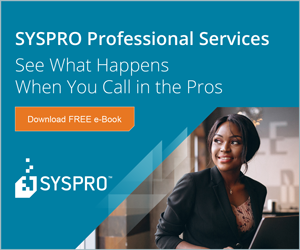 Increasingly, customers have options and choices, including the option to ignore imposed solutions they perceive to be unworkable and dysfunctional. Another example beyond that of e-tolls is now raising its ugly head. 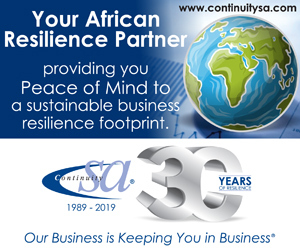 This comes in the form of the unworkable DoE, Nersa and Eskom policies, regulations, procedures and implementation of distributed small-scale embedded generation (SSEG) in South Africa. SSEG comprises grid-tied and off-grid solar photo-voltaic (solar PV) and other relatively small power generation systems (typically up to about 10 MW) installed by customers “behind the meter” on their premises. This is done for own use, or to reduce grid electricity consumption costs, or even to supply electricity into the grid for use by others. SSEG is generally applied in domestic, commercial, industrial and agricultural environments in homes, buildings, warehouses, parking lots, factories, mines and farms. In times of rising electricity prices and utility supply constraints, SSEG provides benefits to the customer by reducing grid electricity usage costs and increasing security of supply, as well benefits to a constrained utility that is unable to meet electricity demand from its own centralised generation capacity and grid. In metros such as Johannesburg, Ekurhuleni, Cape Town and others, the grid electrical energy and demand charges of existing electricity tariffs are already exceptionally high for commercial and industrial customers. For such customers, who use electricity mainly during the daylight working hours, the business case for solar PV SSEG is already a no-brainer, based on grid electricity cost savings alone. Furthermore, SSEG has been identified as the quickest option to bring literally thousands of megawatts of new generation capacity to the grid within six months to one year, at no cost to the fiscus, Eskom or municipal electricity distributors, in order to relieve Eskom of the burden, which it is clearly failing to meet. In light of these opportunities, the response by the DoE, Nersa and Eskom has been truly dismal. On 10 November 2017, a Licensing Exemption and Registration Notice for SSEG up to 1 MW was published by the Minister of Energy in the form of Schedule 2 in the Electricity Regulation Act (ERA), to replace the previous Schedule 2 in the Act. This new Schedule 2 exempted SSEG installations up to 1 MW from the burdensome requirement of having to be licenced by Nersa, but instead requires grid-tied and off-grid SSEG installations up to 1 MW to be registered with Nersa following a new registration process still to be put in place. In addition, the new Schedule 2 requires all grid-tied and off-grid SSEG installations above 1 MW, whether for own use or not, to have an allocation within the national Integrated Resource Plan for Electricity (IRP). If no allocation is provided in the IRP, then permission from the Minister of Energy to deviate from the IRP is required on a case-by-case basis. In addition, a full generation licence from the regulator, Nersa, is required for all SSEG installations above 1 MW, following the same process as that required for a large Eskom power station of say 3600 MW. But the madness continues. The notice of 11 November 2017 contained several inconsistencies, misunderstandings and errors. Therefore on 8 June 2018, the Minister of Energy published draft SSEG regulations (rules) and a notice of intention to amend the above Schedule 2 in the ERA, for public comment by 8 July 2018. But despite the public comment process having taken place, to this day the flawed Schedule 2 of 10 November 2017 has never been amended, and the SSEG regulations (rules) have never been published or gazetted. Then in November 2018, the DoE provided Nersa with a new draft Licensing Exemption and Registration Notice and Schedule 2 for SSEG installations up to 1 MW for concurrence by Nersa following a public process, before promulgation and gazetting. To date this has not been done. Instead, on 15 December 2018 Nersa issued a notice and commenced a public comment process over the festive season (closing 15 January 2019) in respect of a proposed R200 registration fee for SSEG installations. Following from this, a R200 registration fee was decided upon by Nersa, but the R200 registration fee has never been gazetted, and the affected SSEG sector has never been advised. Then in February 2019, the DoE provided Nersa with yet a further revised draft Licensing Exemption and Registration Notice and Schedule 2 for SSEG installations up to 1 MW for concurrence by Nersa following a public process, before promulgation and gazetting. Again, to date this has still not been done. However Nersa has advised EE Publishers that this second revised Notice and Schedule 2 is expected to go to the Nersa electricity sub-committee (ESC) and Nersa board for review in April 2019, after which there will likely be a 30-day public comment process, followed (hopefully) by concurrence by Nersa. The Notice and Schedule 2, once concurred by Nersa, will then revert back to the DoE for review by the Minister of Energy, before final gazetting. No timeline has yet been provided. Then in mid-March 2019, without advising the affected industry in any way, Nersa surreptitiously published the Registration Procedure for SSEG installations up to 1 MW dated 20 August 2018 on its website. The registration procedure is however based on the flawed Schedule 2 of 10 November 2017 in the ERA, which the Minister of Energy announced on 8 June 2018 would be amended. The regulations (rules) for SSEG installations that were published by the minister of energy on 8 June 2018 for public comment have still not been gazetted, and no timeline has been provided for this. In the meantime, on 27 March 2019 Nersa formally advised EE Publishers that, to date, Nersa has not accepted a single application for registration of an SSEG installation up to 100 kW. Instead Nersa has been advising prospective applicants to await the amended Schedule 2 of the ERA, as the requirements for registration may change. Nersa has also advised EE Publishers that, to date, only 18 applications for registration of SSEG installations from 100 kW to 1 MW have been received, while one has been rejected, and the remaining 17 are still being processed. The applications would then need to be approved by the Nersa ESC and board before registration can take place. Thus, to date, not a single SSEG installation up to 1 MW has been registered by Nersa since the Licensing Exemption and Registration Notice for SSEG up to 1 MW was published by the Minister of Energy on 11 November 2017. As indicated earlier, SSEG installations above 1 MW require authorisation by the Minister of Energy for deviation from the IRP, as there is no allocation in the current IRP2010-2030 for SSEG above 1 MW. For about a year now, DoE officials have been advising prospective applicants for SSEG installations above 1 MW to await the new IRP, which may include an allocation for SSEG installations above 1 MW. The latest draft IRP2019 has only recently been received by Nedlac, and is currently undergoing a Nedlac consultation process between government, business, labour and communities. Only thereafter can the draft IRP2019 proceed to the cabinet for policy intervention, before final approval and gazetting. Nedlac has advised EE Publishers that its process typically takes between three and six months. Incumbent monopoly electricity utilities and electricity distributors perceive that the widespread adoption of SSEG undermines their revenue and business case. As well-heeled domestic, commercial, industrial and agricultural customers install SSEG to protect their interests, they argue that poorer customers will face rising prices as utilities increase their tariffs to cover their declining sales volumes in terms of the current regulatory pricing dispensation. Some customers see the chaotic policy, legal, regulatory and implementation framework for SSEG in South Africa as perhaps just another symptom of incompetence by and mismanagement between the various sate entities. Others suggest that factions within the DoE, Nersa and Eskom are deliberately trying to delay and frustrate the adoption of SSEG as a part their political agendas to protect vested interests in the status quo. It should be noted that, in theory, an SSEG installation up to 1 MW cannot be legally connected to the distribution grid or operated unless it has been registered with Nersa. Similarly, in theory, SSEG installations above 1 MW cannot be legally connected to the distribution grid or operated without written permission to deviate from the IRP from the Minister of Energy, and a generation license from Nersa. The reality, of course, is that in face of cumbersome and dysfunctional SSEG policies, regulations and procedures, the legal requirements of the central planners and regulator are simply ignored as customers do their own thing, knowing that the regulations are essentially unenforceable. However one thing is certain: SSEG provides the quickest option at least cost to government and Eskom for new generation capacity in South Africa. By lifting the policy and regulatory hurdles, and through active encouragement and incentivisation, SSEG could deliver several thousand megawatts of new generation capacity within six months to one year that would avoid Stage 4 load shedding of the productive economy during daylight working hours.